In the second post of the Ekalavya Project, here are my musings and some compositions on Raga Charukeshi. This raga comes to us from Carnatic music. It the 26th Melakarta in that system. Charukeshi has the following notes: Sa Re G M P d n (lowercase= komal swara). From the note point of view, it is marginally different from Darbari – only the Ga is shuddha instead of komal. However, the treatment is very different. My survey of Charukeshi has found multiple approaches to this raga. One can dwell on the d n of the lower octave, tapping into a “Darbari -ish” style of Charukeshi. On the other hand, one can focus on the Sa Re Ga Ma Pa shuddha swaras, conveying lightness, and brightness of mood. Tradition has it that Charukeshi is associatied with feelings of devotion and surrender. I agree. I have not found a lot of sarod performances of this raga. Finally, a rather unique Charukeshi. Derived from a raga which Ustadji calls Haripriya Kanada, this has the unusual movement of starting from the Ma (madhyam). It also employs note combinations not seen in standard Charukeshi renditions. The antara is a bit of finger breaker. This is probably not the best recording, but please bear with me for the moment. 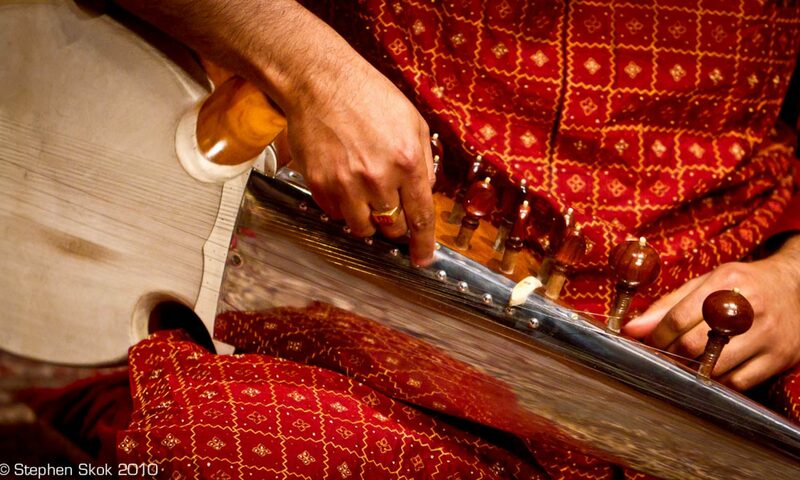 The antara bears the signature climb to the upper Sa, so common in vocal music and in Ustadji’s style. Notations will be provided later. In each of these compositions, there is ample room to improvise in the Sthayi passage in the last section. Go for your life !!! Thanks for providing such a wonderful blog, which is of rela use for the sarod learners. Thanks so much for the detailed melodic analysis. Being a southern Indian, I am so deeply impressed to see how the northern imagination has transformed ChaarukeSi into such a sublime experience. (My private name for it is DurgA-ManOhari. Each Gat you have given captures a unique feature of this multi-valent, complex RaAg. ( I have read somewhere that Ustad Amir Khan Sahib omitted the Ga in the ascent, but I do not if it is correct. By omitting Pa, I think a deep “yearning” kind of feeling can be added to it judging from the singing of the raag by some singers.) Thanks again. Thanks DKM – I do enjoy the Carnatic treatment of Charukeshi as well, as it opens up new dimensions to me. I prefer emotional treatments, which is why I’m always on the lookout for a “special angle” from various artistes for each raga. Re: Ud Amir Khan – he was an ocean (as Ustad Amjad AK calls him),but I haven’t heard this particular one with the Ga omitted, so if you can point me to a recording, that’d be appreciated. Among the best Charukeshis that I have heard is Shri Kushal Das at the Dover Lane conference – it was a masterpiece of emotional exploration. Charukeshi is often used as a common North-South Jugalbandi raga, which usually deteriorate into circuses. Thanks for your comments. I want raga charukeshi detail & bandish. Thanks. Deepak Ram performs a beautiful Charukesh with the great Anindo Chatterjee on his CD “One Breath”.